The uniforms the little girls from Columbus will be wearing for their trip to the Big House in two weeks. Most Michigan folks will agree that these are pretty ugly...but I'll give them props on the helmet, it sure beats the sparkly silver helmet adorned with pot leaf stickers. 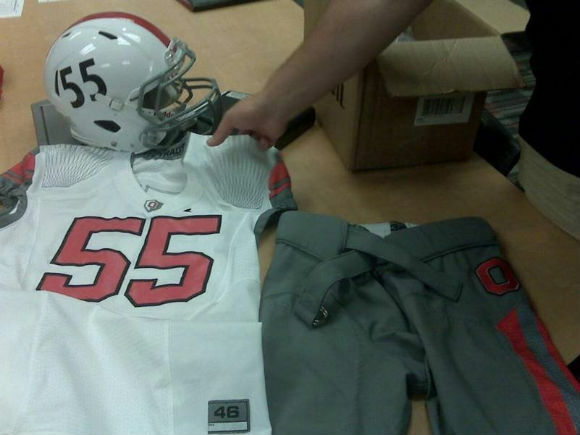 These are the throwback uniforms tOSU wore during their national championship season of 1954. This is to celebrate the 55th anniversary of that team. But I'm wondering what's going on with the design on the shoulder and the crest on the v-neck? And where's the huge Nike swoosh??? The only thing that we could do to make this a true "throwback" would be to hike up the white socks. I'm all in favor of that move if we wanted to make the tOSU game a true throwback event. But, I'm fine either way. All I can say right now is, thank goodness for Adidas. LMAO Old Jersey, New Jersey, Throwback Jersey, it doesn't matter, OSU is still gonna whoop up on this pathetic Michigan team. 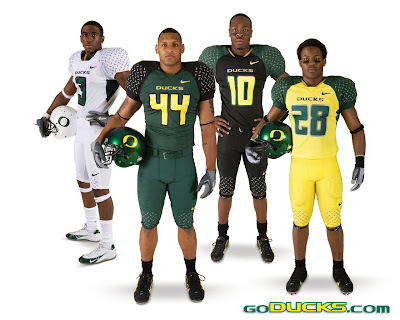 Let me get this straight: You think OSU's helmets are bad? I am continually amazed that ANYONE could think those winged helmets are anything but ugly and stupid looking.